DROP4DROP - DROP4DROP: Looking towards 2018! This Christmas in the UK we are predicted to spend billions of pounds on gifts, decorations, food and drink. The average British household spends between £600-£800 over the festive season. At a time when we hold considerable financial power over where and how we choose to spend our money, there remains 663 million people who do not have access to clean water in the world. Access to clean water reduces time spent on water collection, acts as a preventative measure to many waterborne diseases and saves money spent on treating water and sanitation related issues. Instead of spending their time collecting water, children are able to spend more time in school and pave the way for developing their own opportunities and success. For every $1 invested in water and sanitation, there is an economic return of between $3 – $34, depending on the region of investment (WHO). Women and children are often disproportionately hit hardest by lack of clean water. As primary collectors of water, they suffer long journeys to unclean or rationed sources of water. Sanitation and hygiene training on basic issues such as hand washing are highly effective at reducing preventable diseases. The provision of safe, clean and sustainable water is a gift that is crucial to the eradication of poverty. 2017 has been an incredible year at drop4drop – with your help we have been able to provide clean water projects to over 160,000 people in need. However, our plans for 2018 rely on the continuation of generous donations and support. 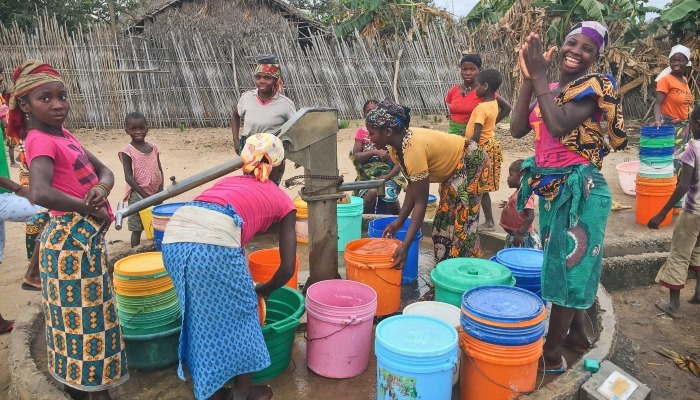 We are excited to start construction on clean water projects in Tanzania, Malawi and Zambia, alongside our work in Andhra Pradesh and Uganda. With your help, we can continue to provide even more people with a clean source of water – putting us one step closer to achieving our goal of clean water for all! Thank you to everyone who has supported drop4drop this year, we cannot wait to achieve more amazing things in 2018!